Most Hamilton calendar watches are automatics - and there are loads of them. However, there are only a handful of manual-winding calendar models out there... six to be exact. One of them is the 1966 Dateline S-675. The S-675 was produced through 1969 so you will see them from time to time but it's not a common model. The Dateline S-675 came in a 10K RGP case - as you might surmise by the 600-designation of the model number. The model came in a one-piece waterproof case with a complementary bracelet. Other than the date complication, the S-675 features a decorative dial with silver and gold accouterments. 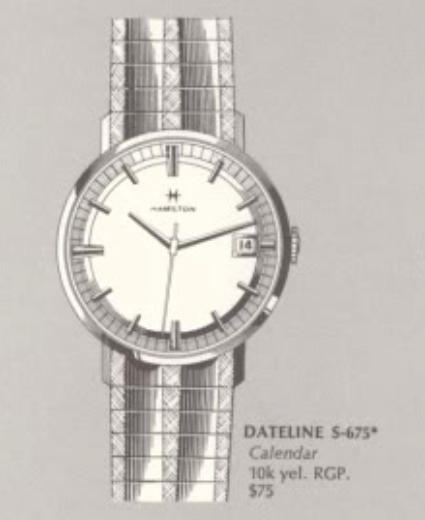 All of the Dateline S-series models I have come across have used the Hamilton 674 manual winding movement, based on an ETA grade. It's basically the same as the automatic version but without the rotor assembly. My S-675 project arrived in decent shape and with it's original bracelet to boot. Although the watch appears to run, the date does not advance properly and is stuck between 8 and 9. I'm not sure what's up with that but I suspect it's got something to do with the index lever under the dial. Sometimes one-piece cases can be confusing and give you the impression that they are a two-piece design. You'll even occasionally see marks on the case back from someone's prior attempts to open it... but not this time. It's clearly a one-piece case and opens though the crystal. The bracelet is a JB Champion design - good confirmation that it's the original bracelet. You won't find a Speidel bracelet originally outfitted on models from this era. The 17 jewel 674 movement is in good shape... a little dirty but otherwise appears like new. There's a movement ring to keep the movement secure when it's installed in the case. That just pops off. There are no marks inside the case back from prior watchmakers so I may be the first person to open this watch in almost 50 years. One thing that is interesting is the two sets of numbers inside. One is a unique number for the watch case and the other is the number of the model. The D-number is the case serial number and the 923765 is the model number. I don't really pay any attention to the model number but I'm fairly certain that the last two digits of the number are the year of the watch... in this case 1965. So why is this a 1966 model? Well... I don't know for sure but my guess is Hamilton watches were introduced like automobiles and the new model year actually came out in the middle of the prior year. So a 1966 model was actually introduced in late 1965. That's an educated guess, but a guess nonetheless. It would be interesting to see another S-675 and verify if the last two digits ever change... like for a 1969 version, or are they all the same? Without the dial in place you can see the mechanism for the date complication. The golden wheel in the upper left will move the date wheel one space when it reaches midnight. However the index lever under the bridge near the number 24 is what centers the date under the window in the dial. It's not doing it's thing properly so the date wheel doesn't advance. The bridge that covers the lever is a little dented (it appears) so that might be the issue. Everything is cleaned and dried so now it's time for reassembly. The "easy part" is getting the movement to run - and it's running nicely now so I can put it on the timer. After this I'll have to do the hard part - and fix the date mechanism. Things look good... the amplitude is a little low at 222 but I didn't wind the watch fully since there's no crown. It will increase when I wind it more fully. Believe it or not, I had to work on this watch for another hour to get the date to advance properly. I tweaked the bridge a little and lubricated everything and after a bunch of attempts it finally was working as it should. Now that the watch is reassembled and running well, I think it looks great. The crown is original and pretty worn. I don't have a replacement with the Hamilton H logo so I'll leave it as is. That's the only distraction that this watch has and it's a very minor one at that.